Elle Chambers is Edinburgh’s hardest working insurance investigator, and one who solves cases using unconventional means. Supernatural means. Elle is a witch–and a damn good one, too. Assigned back-to-back cases, Elle must first find a missing bad boy who might or might not be a werewolf. Next, a simple missing artwork case turns out to be not so simple. What Elle is about to discover will change her life forever…and open her heart to the possibility of love. 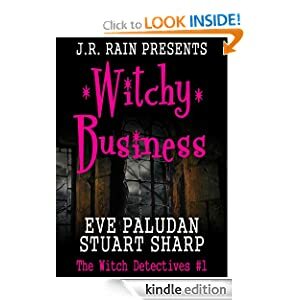 Witchy Business is a full-length novel and the first of a trilogy.